Nestled in the hills, in historic downtown Tomales, California, the newly-built Continental Inn is a replica of the original turn-of-the-century hotel that stood in the same spot  the cornerstone of this picturesque community's quaint downtown. 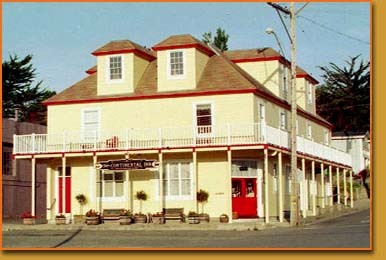 With nine unique, spacious rooms  each with private baths and brim full of antiques, The Continental Inn offers that elusive combination of unhurried charm and modern comfort & convenience. Down comforters, thick towels and good reading lights will bring you relaxation in the evenings. Read, relax, stroll through the historic village and enjoy Tomales. We're a 5-minute drive from Dillon Beach and outdoor attractions, like kayaking, birdwatching, cycling, whalewatching and clamming, that make us the perfect choice for a weekend getaway. Point Reyes National Seashore is just a 25-minute drive away.